Mid-strength beers are a challenge for brewers. Walking a tightrope of mouthfeel, flavour and balance at around 3.5 percent ABV has led to many session beers being labelled as "donuts" by the brewing community – all aroma and bitterness but with no body in the middle. Sure, you can make a great caramel malt based mid, but is this really what you want in the height of summer? 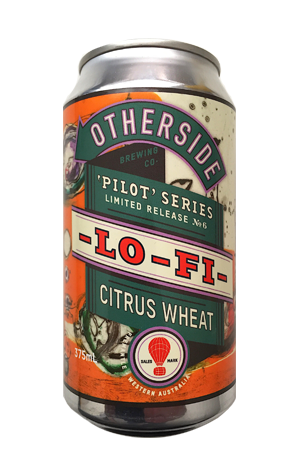 For a different view, take a trip to the Otherside where its first low ABV beer sees the team embellishing an American wheat with citrus, totally sidestepping any of the concerns above. Although riffing on a music movement known for a laissez-faire attitude to recording quality, Lo-Fi displays clear and bright grapefruit and orange flavours with the slight wheat haze accounting for the nom de plume while the finish is crisp and dry. Head brewer Rhys Lopez describes this as the perfect post-brew refresher after a humid day at the brewery. For the rest of us, its release lines up nicely with the start of summer entertaining, beach picnics and responsible consumption outdoors. And, continuing Otherside’s support for the local arts community, this Pilot Series release features "Three Sailors" by Fremantle printmaking artist Junko Kitmura on the label.